Front page of the Wall Street Journal, “Breakthrough Product of the Year” by Success magazine, “First Glycemic Patent Ever Awarded Worldwide”, First Scientist to Address the United Nations General Assembly on L-Arginine (Sickle Cell Conference), Who’s Who of American Inventors . 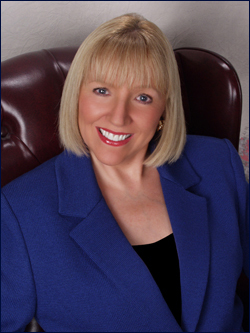 . . these are the accolades of renowned researcher, Dr. Ann de Wees Allen®. Both scientifically and financially, Dr. Ann de Wees Allen® has reset the standard definition of success. With more than one Billion dollars generated from global licensing of Dr. Allen’s Patents and technology, financial experts are paying close attention to the next discovery that evolves from Dr. Ann de Wees Allen’s laboratory. As Chief of Biomedical Research at the Glycemic Research Institute®, and Chief Scientist at Skinny Science® Corporation, Dr. Allen’s 25-year history of clinical research has produced a plethora of cutting-edge Edible Computer Chips® that are designed to address anti-aging, diabetes, and the current childhood and adult obesity epidemic. The breakthrough technology and products developed by Dr. Allen’s research team focus on the Glycemic Index and include Skinny Science® Coffee, Skinny Science® Ice Cream, and Skinny Science® Chocolate, all of which are designed to be Low Glycemic, Non-Cephalic (Brain Glycemic Indexing), and to avert storage in human fat cells. Skinny Science® foods, beverages and sweet-treats are specifically designed to be guilt-free, all-natural (no artificial sweeteners), Diabetic Friendly®, Kid Friendly®, and Diet Friendly. So, who wouldn’t want chocolate and ice cream that tastes great, is natural, and designed to avoid fat-storage? Dr. Allen’s guilt-free indulgences, thus the name Skinny Science®, also address Food Addictions, which has been the focus of recent NEWS headlines (April 2010) revealing that the obesity epidemic is related to human food addictions, and the fact some foods are identical, in the brain, to crack cocaine. In 2010, scientists proved that food addictions are related to Dopamine D2 Receptors in the brain, which parallel the same response to addictions such as cocaine, alcohol, and smoking. Dr. Ann de Wees Allen’s medical and research staff is dedicating the next 2 years to studying Food Addictions at the Glycemic Research Institute® Human In Vivo Clinical Trials Laboratory (www.Glycemic.com), including Dopamine D2 Receptors and their relationship to the obesity epidemic. The results and findings of this research will be published in major peer reviewed journals. Medical discoveries during these trials will provide new solutions to the obesity epidemic, and will help propel fast food companies into taking responsibility for weight gain in America, by changing the metabolic response of the foods and beverages that are made available to the public. The best predictor of future scientific breakthroughs, are past scientific breakthroughs. With this in mind, Dr. Allen’s team has already proven that their past 25-years of research has generated huge scientific and financial success, and will continue to do so in the future.